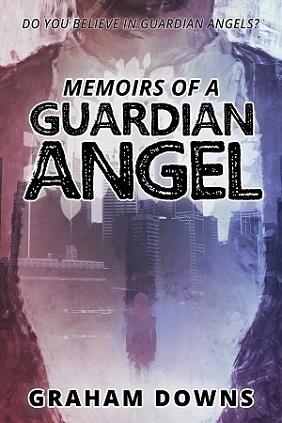 People often say they have a guardian angel looking out for them, especially when they survive a harrowing experience, like almost crashing their cars, falling off ladders, or choking on pieces of chewing gum. After a near-catastrophe like that, how often have you thought, "Wow, my guardian angel must be really looking out for me today?" But I wonder how many people actually believe it to be true. There aren't many people who talk openly about their guardian angel when things are going well... are there? My name is Adam, and I am a guardian angel. I don't recall much about my life on Earth. I have no memory of who I was or how I died. But what I do remember, is that I was one of those people who truly believed that guardian angels existed. When I died, I discovered the truth: not only do they exist, but there is a whole administrative division in their world, dedicated to their management and training. Upon my arrival, I was greeted by a burly, balding man with a round face and a white robe. He introduced himself as Peter. "Hold on," I said. "Why are you human? I thought everyone up here wore halos, had wings, played the harp, and shone with light." Peter chuckled. "I get that a lot. First of all, contrary to what you humans believe, this is not 'up here'. This is the World Beyond the Veil, and it exists more-or-less adjacent to the world you were occupying a few minutes ago." Up until that point, I hadn't really thought about it. I was dead. Of course, I was dead. And this was Heaven. Peter. The Pearly Gates. The whole shebang. I tried to remember what had led me here, or where I was before. I had nothing. It wasn't as if my memory was a blur. It just wasn't there. I choked back tears and ran my fingers through my hair. "H-how did it happen?" "I'm not at liberty to say." Peter pursed his lips and exhaled loudly. "Now if you'd please stop interrupting me." "Where was I? Oh, yes, the reason I appear so human is that I'm the first being you people see when you arrive, and we need to make your transition as comfortable as possible. You humans have no idea how things really work, and if the first thing you saw was me as I truly am, you'd never be able to handle it. Those beyond this gate appear quite different, but also not what you'd expect. There are no halos, no wings, no shining light, and no harps." He pointed to his long white beard. "At least I have this, though. That's something, right?" I gasped, still unable to comprehend what was happening. And why couldn't I remember anything? Peter continued. "The beings you will meet on the other side of this gate look more like translucent blue outlines. It's difficult to explain, but that's actually what you look like now, too." I looked at my hands and saw what he meant. The outline of my fingers was very pronounced, but my hands themselves were blue glass. Through them, I could see the ground. And then I noticed one more thing—the ground didn't look like any ground that I was used to. It was puffy, white, and cushiony. If I shifted my weight, it was almost like I was standing on a jumping castle. I felt like I was going to pass out. I was shaking like a leaf. Peter placed his hand on my shoulder. "There, there. It's all a bit much at first, I understand. But if you'll just go through that gate, everything will be fine." He studied the clipboard, resting on a lectern in front of him. "Hmm. Interesting. You're meant to speak to John about being a guardian angel. Just ask for him when you get to the other side. He'll explain everything you need to know." I was meant to speak to whom? About what? I opened my mouth to speak, but before I got to say anything, the huge golden gates behind him parted of their own accord. "Well, hurry along then. We can't stand out here, chatting for the rest of eternity." Just as Peter promised, the world beyond the gate didn't look anything like the world outside it. It didn't look anything like the human world, either. For one thing, there seemed to be no ground. If I looked down, the puffy white cushiony stuff was gone, to be replaced with nothing. Below my feet was a black void. If I bent down and tried to touch it, I couldn't—my hands dangled below my feet and I felt nothing but air. I could touch the soles of my translucent blue shoes without losing my balance. There were many beings ("people", for want of a better word) in this void, but I saw nothing that could be considered a landmark. Just inky blackness punctuated with these translucent creatures. They were distinguishable from each other by the outlines of their faces and hair-line drawings, filled in with glassy blue. I presumed they were angels. The creatures were all hurrying to-and-fro, I guessed busy with whatever it was that angels did. I was about to find out just what that was because when I looked again, one of them was walking purposefully towards me. "Hi," he said, extending out his hand. "I'm John. You must be Adam; I've been expecting you. You're going to be a guardian angel." What struck me the most was that I didn't quite hear him with my ears. I saw the blue outline of his lips moving, but the sound of his voice sort of materialised in my head. When Peter had spoken outside the gates, I'd heard him in the normal way. That must be something else they do to help us recently departed adjust. Thinking of that made me choke up again, but I swallowed back the tears and took his hand. I was about to respond when he cut me short. "No time for pleasantries. Let's get moving. The first day of training has already started." John had high hopes for me as a guardian angel because not many humans actually believed in them. When I was alive, I'd been one of the few who had. He said that was the first obstacle conquered already. The training consisted of a group of us sitting in a room. Things approximating chairs were arranged to face a large screen. Not that I think we needed either the chairs or the screen, but I think it was a bit easier for us to imagine it that way. We sat on the chairs as John showed us images of various guardian angels in action, at various places and various points in time on Earth. John said that we could be sent anywhere, at any time. In fact, he went on, time—as we knew it when we were alive—didn't exist here. When we were alive, we were taught to see it as a continuous line, with a past, present, and future. Here, it was more like a ball of wool, and at any point, one could take a pinch of it and visit Earth's history at the time represented by that pinch. "But what about the future?" asked one of my classmates. "The future is a bit too complicated for that analogy," replied John. "If you could imagine that each of those pinches of wool where actually another ball, you might come close to understanding. There are an infinite number of possible futures, and there's no telling with any certainty which one will come to pass. We guardian angels don't often concern ourselves with it, though. We're there to help the people who live and have lived." At one point, I looked up at the screen and saw a female guardian angel, sitting in a ghostly armchair with her hands rested on the arms, and a determined expression on her face. On her head was one of those old-timey open-faced crash helmets, and the whole contraption rested on the roof of a car going at considerable speed down a road. "Who is that?" I pointed at the screen. "Oh, that's Liz," replied John. "She likes to show off. Right now, she's in the year twenty-sixteen, protecting the driver of that car, a bit of an accident-prone woman who's had three near-misses on the road in as many months." While he was speaking, a car on the opposite side of the road veered out in front of Liz. The angel leaned to the left, and the car she was protecting coasted out of the way, narrowly avoiding a head-on collision. The woman driving the car pressed her hooter, and the other car flashed its headlights angrily. We all applauded the ease with which Liz had averted disaster. "There's another thing you ought to know," said John. "When you're out there, in the field, nobody else can see you. Some sensitive humans, like Adam was, might be able to feel your presence, but that's it. You also won't see any other angels. They're there, of course, some of them protecting other humans yours comes into contact with, but they can't see you either." "What will our first mission be like?" asked the student who'd asked about the future. "That, I can't say. None of us chooses our assignments, and none of us chooses when they're finished. In fact, when your training is finished, you will simply disappear from here without warning, and we'll be able to find you using the monitor." As it happens, I was the first person to "graduate". A few weeks later, I was sitting with the other students, watching a guardian angel on the screen, when I started to feel dizzy. I stood up and pressed my hand against my head, and then all at once, it felt as though my insides were coming up through my throat. Not that I had insides anymore, and no throat either, for that matter, but if I had had insides, and I had had a throat, that's what it would've felt like. I pressed my hands over my mouth, trying to suppress the unbelievable urge to vomit. The other students leapt from their seats and started running around, unsure of what to do. But John just stood there, watching and smiling. A moment later, my world was spinning. Like some psychedelic spiralling pinwheel in a low-budget psychological thriller movie. The spiral grew, engulfing my whole vision, and kept spinning. Spinning, spinning, spinning. And then it was spinning in the opposite direction, unwinding itself. The world I now gazed upon was not the world it had been. It was a room. Just an ordinary room, with a beige carpet on the floor, and a television set against the wall. Looking around, I saw a green lounge suite—a single chair with a double and triple couch. The walls were painted eggshell, and on the floor, I saw a girl. A human girl, with brown hair in pigtails. She was kneeling on the ground, pushing a small plastic fire engine, making vroom vroom noises. I heard a voice, coming from somewhere else in the house. "Rebecca, baby! Come on, it's time to go wash your hands."